In almost any story of futuristic utopia, people always travel around in private flying vehicles. The freedom to voyage through the air, whenever and wherever you choose, is a deep-seated human desire. In our current age, it is one of the ultimate luxuries. Royalty, celebrities and high-powered CEOs have been flying about on private planes for decades. But the luxury jet market has expanded enormously over the last dozen years or so, and the recession has done less to dent this market than you might expect. When times are hard, some deem it even more important to travel with maximum speed and flexibility, in order to steal competitive advantage. So let’s imagine it. You show up at your nearest airport (which might actually be a tiny local airfield), stroll onto the tarmac, and board your plane immediately. No two-hour pre-flight arrival, no queuing, no check-in, no sitting around in a terminal that resembles an oversized shopping mall. Of course no sensible person begrudges the time spent getting through security for a commercial flight (and let’s give a little cheer right now for all those unsung people who work hard to keep us safe), but there are occasions in business when time really does mean money, and when airport time needs to be kept to an absolute minimum. 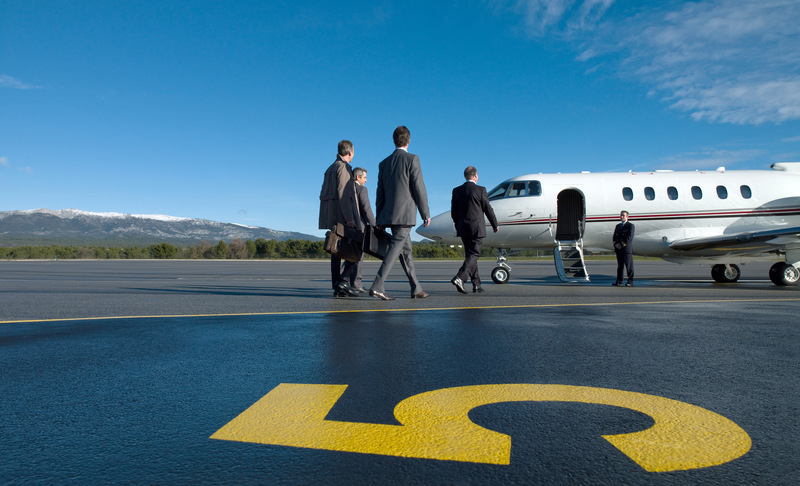 The chief benefit of flying privately is saving time, which can be used productively on other things. Your plane leaves from and arrives at the airports most convenient to you, every flight is direct, and except in cases of extreme weather, there are no delays in take-off. Crucially, you choose the time you want to fly; you’re not beholden to an airline’s schedule. Your plane will wait for you if something comes up and you’re running late. The other chief benefit of course is the privacy and comfort on board. You can work in absolute peace or conduct a lively meeting. It’s true that many commercial airlines offer superb levels of comfort to business travellers, and that’s certainly not to be sniffed at, but a private jet offers an unrivalled sense of ease and seclusion – which is sometimes what you crave. The service is personal, the crew knows who you are, and meals are catered strictly to your taste. OK, you like the sound of all this. How can you travel this way? There are three main options: charter a jet, join a fractional ownership / block-booking scheme, or buy a jet outright. For the first you’re likely to make an outlay of four or five figures, for the second you’ll probably spend between five and six figures, and for the third you’re looking at a sum seven to eight figures long. Now, take a moment to assess what kind of traveller you are. Do you spend less than 20 hours a year in the air? If so, chartering is recommended. Do you rack up 30 hours or more flying each year? Then fractional ownership or block booking might work well for you. Or do you spend at least 200 hours annually sitting in the sky? Wow. Really? Maybe it’s time to bite the bullet and buy your own plane. With prices of small jets starting at about £4m, the average frequent flyer may well prefer to think instead about joining a fractional ownership or block-booking scheme. The beauty of both is that you get access to a whole fleet rather than just one plane, so there’s always an aircraft ready for you. If you own just one, remember that it’ll be out of action at least once a year for technical maintenance. The company NetJets, for example, offers a fractional-ownership share in a seven-seater jet start at around €143,000 – entitling you to 25 hours’ flying time per year for three to five years across their fleet. UK-based Avolus offers similar block-booking charter packages starting at 25 hours. Both companies, like others, precisely tailor FO and chartering packages to each client’s needs, and have a very wide range of prices and options. There’s no getting round the fact that private flying isn’t great for the environment, of course. Your CO2 emission per person is going to work out higher than if you’re sitting on a commercial plane with a hundred other people. So if you fly private, do try to be environmentally friendly in other ways to compensate. In the meantime, settle back and enjoy the flight. You’ll be there in no time.